The Indian Space Research Organization has discovered, with the help of the Chandrayaan-1 spacecraft, a “giant underground chamber” near the Moon’s equator, in the Oceanus Procellarum area. But in actuality, this chamber is far neater. 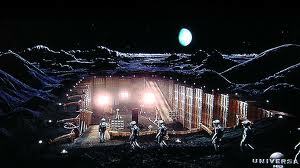 More than one mile long (1.7 kilometers) and 393 feet wide (120 meters), it is big enough to contain a small lunar city. The Indian researchers have published a paper detailing their findings and talking about the possibility of making this giant underground vault as a future human base. The settlement would be protected from radiation, micro-meteor impacts, dust and extreme temperature changes by the lava structure that provides a natural environmental control with a nearly constant temperature of minus 20 degrees Celsius (which is what the temperature was yesterday here in Toronto, where I live), unlike that of the lunar surface showing extreme variation, maximum of 130 degrees Celsius to a minimum of minus 180 degrees Celsius in its day-night cycle.